"A refreshing twist on tabbouleh. Quinoa is used instead of bulgur, pomegranate in place of tomatoes and mint replaces cilantro. The pomegranate gives the salad an irresistible tangy crunch! Great side dish for a Mediterranean-style brunch of omelets, fresh bread, cheeses and freshly squeezed OJ." Bring water and quinoa to a boil in a saucepan. Reduce heat to medium-low, cover, and simmer until quinoa is tender and water has been absorbed, 15 to 20 minutes. Cool to room temperature. 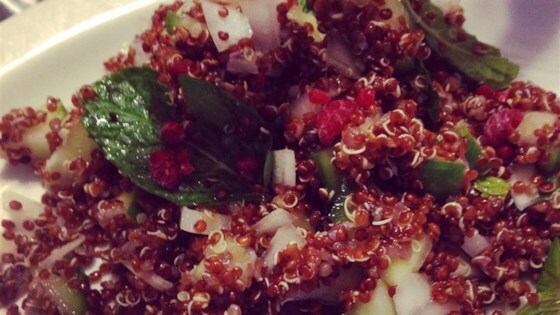 Stir quinoa, cucumber, onion, and pomegranate seeds together in a bowl. Stir lemon juice, olive oil, mint, salt, and pepper into quinoa; toss to coat.